I’m very happy to inform you, that’s I passed in PMP® certification exam on 4th of march, it was paper based exam, hence it took 10 days to know the result. I want to take this opportunity to thank Saket for his amazing videos, also I want to thank Manish for his patient, and answering all my questions in forum, and of course all iZenBridge team. 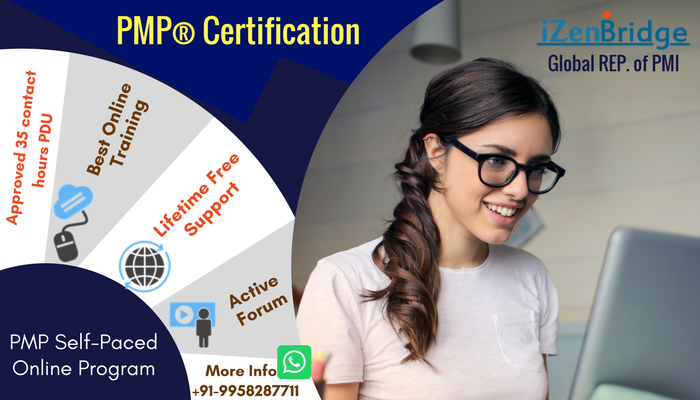 The iZenBridge package was great help for me to pass the PMP in first attempt, it makes the PMP journey very easy, and amazing in the same time. Through classroom video, and continuous and quick support. a.	I can firmly confirm, that they are covering most of the topics in PMBOK. b. White board style, make easy to understand the topic, in very amusing way, and visualize the process instead of memorizing it (I like mostly procurement, and risk videos). II. I enrolled in iZenBridge, then immediately the support start with very high professional way. and direct me in filling my PMP application. III. Here in Ecuador, only paper based test is available every three months, hence I schedule my exam from start. IV. I went through PMBOK once, and in details, hand in hand with Saket video. followed by chapter assessment from iZenBridge, scored between 70-90%. V.	I went through iZenBridge forum, review so many questions, and I was active member, the forum helped me to enhance and improve my logical thinking and alien it with PMI concept. VI. Clarification sessions were very helpful, especially the one did by Saket around end of the year 2016 (Special PMP Session by Saket Bansal , 5 sessions). VII. I went through RITA MULCAHY once in details, and complete the exam at the end of each chapter. scored between 70-93%. VIII. I found the chapter exam of RITA MULCAHY more difficult than the once from iZenBridge. IX. At this point I did not do any mock test, just Knowledge area test from RITA MULCAHY and iZenBridge, and off course many many questions from forum. a. Each exam has 50 questions; hence I use to do 4 exams to simulate the number of questions in finial Exam/mock Exam. b.	Scordo has 18 Exam (50 questions each), the first 10 are very easy, but they have a lot of information. c.	I found the length of question in Scordo, similar to length of question in real exam. d.	I used to review/analyze the answers in details with all the explanations given, and put my note aside, which help me at the end to review them. a. First two Assessments (Test-1, Test-2), have a lot of questions of SND, and EVM. c.	The length of questions is very short compare the one in real exam, hence you don’t need full 4 hours to complete the test (around 2.5 hours). d.	analysis the caps very carefully, and note down all the important information, to review them later on. XII. In total I did 4 Mock tests from iZenBridge, and 4 Mock tests from Scordo (40 X 4 = 200 Questions), My Exam was at 9:00 pm, hence I did all the mock test in the same time, so my body used/adapt to the length of exam (4 hours), and timing. XIII. In last four days, I went through Saket videos, which help me a lot to visualize the complete 47 process, and tool & technique. PMP is not so difficult, and you will be surprised how is easy the real exam, I enjoyed the journey. I wish all the best to all the PMP aspirants and once again thanks to iZenBridge team. Congratulations Housam. All the very best for future endeavors. Saket, I want to go for PMI-RMP, I know you don’t have any training yet, however can you give some advice, and if you can direct me to where I can find the materials which help me to crack PMI-RMP. Congratulations !!! i know you were more prepared than needed for PMP exam, so for your PMP exam was expected to be easy. On RMP, we do not have any idea, since we did not worked in that area so can not advice anything on it.